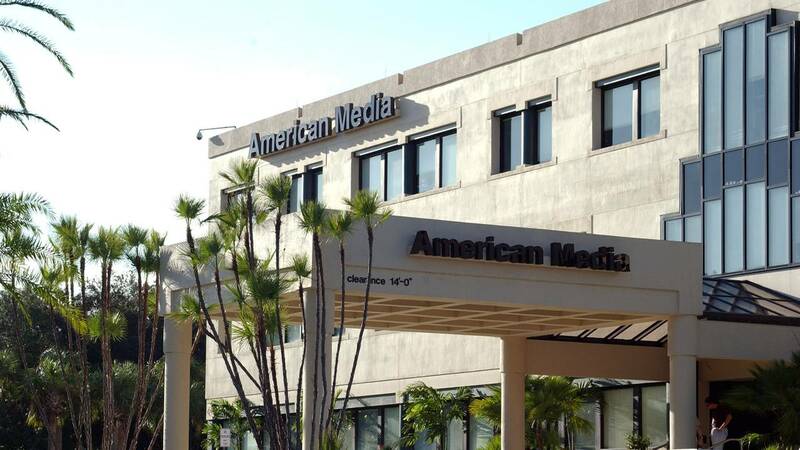 The American Media building, which houses offices for The National Enquirer, in Boca Raton, Florida. Not long after it published a glossy magazine touting Saudi Arabia and its crown prince Mohammed bin Salman, American Media Inc. — otherwise best known as the company behind the National Enquirer — appears to have gone to the Justice Department with a question: Had the fawning publication made American Media a foreign agent? In his blog post last week accusing American Media (AMI for short) of trying to blackmail him, Amazon CEO Jeff Bezos also alluded to a "Saudi angle" involving the company, as if he was leaving breadcrumbs for journalists and prosecutors to follow. The law requires people and companies that are "agents of a foreign principal," working on behalf of a foreign government or political party, to register with the U.S. government and label its information accordingly. The law was originally enacted to combat Nazi propaganda in the 1930s. The ad-free magazine was sold on newsstands. Its fawning portrayal of Saudi Arabia as "the magic kingdom" has been described by some observers as propaganda. It's "Exhibit A in the case of AMI's weird, difficult-to-explain, so far unexplained interactions with Saudi Arabia," Spencer Ackerman of The Daily Beast, who reported on the magazine's existence, said on CNN last weekend. AMI representatives justified the magazine as a savvy business move, citing the crown prince's much-publicized trip to the U.S. last March as the reason "its readers would have a heightened interest in" Saudi Arabia. Pecker's attorney Elkan Abramowitz said in an ABC interview on Sunday that AMI did, in fact, seek financing from the Saudis. But he said the company "never obtained any." The Journal reported Monday that AMI wrote to the Justice Department "after several news outlets wrote about the publication of the pro-Saudi magazine." A partially redacted version of the Justice Department's response, which does not name the media company that had written to it, says the government concluded that the company in question had no obligation to register because there was no business relationship between the company and the Saudis. "American Media does not have, nor have we ever had, any editorial or financial ties to Saudi Arabia," a spokesman for the company told CNN Business in response to questions on Monday. Last year, when NBC News asked AMI if it had collaborated with the Saudis on the project, a spokesman said "absolutely not." But the letter to the Justice Department says that someone at the company in the letter "sought out comments" from an advisor to the Saudi government. The DOJ's response letter said the company had indicated it was "not under any obligation to follow any suggestions made by the advisor." The DOJ's letter said that "if any of the facts with respect to activities undertaken" by the company "in this matter are different in any way from those depicted in your submission, please notify this office," as its registration status may change. Given AMI's track record of deception, there are outstanding questions about the making of the magazine. "We've required foreign media outlets from Russia, China, Japan and South Korea to do so, otherwise Americans have no way of knowing that what they're digesting is in fact content or propaganda that a foreign government is influencing or even directing," she said in an email. "Failing to register as a foreign agent really allows a foreign government to wage information warfare against Americans because they're able to covertly influence Americans without them knowing."